A company that develops rocket engines for NASA has turned that rocket tech into an amazingly efficient method of extinguishing fires that can put out a flaming car in nine seconds. Called the Ultra High Pressure high-mobility fire apparatus, or UHP for short, the system sprays a swirling vortex of fine water droplets at a fire. 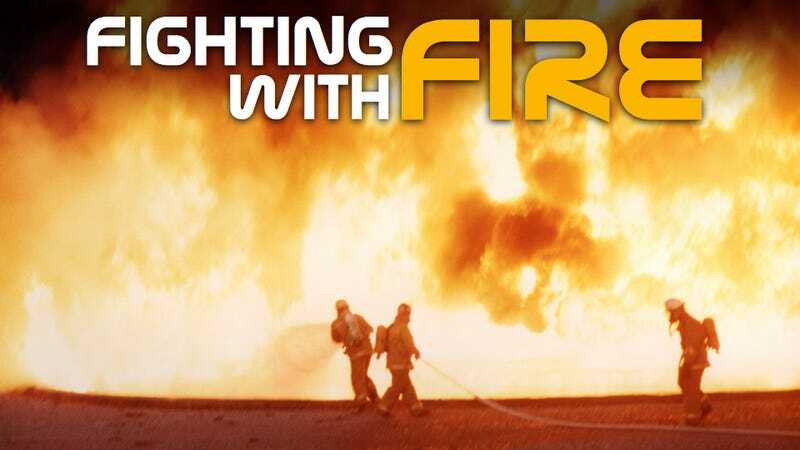 The droplets have four times the surface area of a stream of water from a traditional fire hose, allowing them to extinguish fires faster and more efficiently than traditional systems. HMA Fire, the company behind the technology, tested their 20 gallon-per-minute/1,400 psi UHP pump against a standard 100 gallon-per-minute/125 psi pump. The standard pump took 1:45 seconds to extinguish a burning living room and used 220 gallons of water. The UHP pump extinguished the same fire in 17.3 seconds — almost a full minute-and-a-half quicker — and used only 13.6 gallons of water. "[The HMA system] sucked the life out of the fire and did it faster than anything I've ever seen before," Devin Misiewicz, captain of the Vandenberg Air Force Base Fire Department told NASA's Spinoff Magazine. The UHP pump also reduced the temperature around the fire from 1,400°F to 250°F in about a minute, or approximately two minutes and thirty seconds faster than the standard hose. The UHP pump could be handled by a single person, whereas standard fire hoses required several firefighters to hold and operate. HMA Fire created the UHP technology based on one of its parent company ORBITEC's projects with NASA. ORBITEC's scientists helped develop the cool-wall combustion chamber for NASA rockets, which uses a high-pressure vortex of rocket fuel droplets to confine combustion to the center of the chamber, allowing for smaller, longer-lasting, and cheaper designs. The U.S. Military has already bought in to HMA Fire's new tech, employing 4 UHP units in Afghanistan to fight fuel fires and firebomb attacks. The Navy also uses UHP pumps in the Middle East and the Air Force has them in 12 bases in the US. Municipal fire departments (especially in remote municipalities) are looking into UHP pumps, not only for their safety and efficiency, but because they can be operated without firefighter training. ORBITEC's rocket combustion technology is not yet production-ready, but that hasn't stopped the company from developing this awesome step forward in fighting fires.